The Colorado Flames were an expansion franchise in the Central Hockey League, a Triple-A minor league circuit based primarily in the middle of the United States. The Flames were the primary affiliate of the NHL's Calgary Flames, and, naturally, wore uniforms that were identical to their parent club. The Flames played at Denver's McNichols Sports Arena, a 16,384-seat arena. The Flames filled the void left by the NHL's Colorado Rockies, who relocated to East Rutherford, New Jersey, after the 1981-82 season to become the New Jersey Devils. The Colorado Flames were owned by Detroit native Douglas Spedding, who later owned the Denver Gold of the USFL. Calgary tapped 32-year old assistant coach Pierre Page as Head Coach/General Manager for Spedding's Flames. Year One of the Colorado Flames was a success. Colorado benefitted from the Flames deep farm system, and finished in second place in the CHL, with a 41-36-3 record. A mere two points was all that separated the Flames from the fourth-place Salt Lake Golden Eagles, who had 83. Colorado was 17 points behind first place Indianapolis. The Flames were a tale of two teams in 1982-83. The offense was superb, pumping in 322 goals, second-most in the CHL. The Flames were led by veteran right winger Dan Bolduc, who scored 27 goals and 72 points. Fellow right winger topped the team in goals with 33. Four other Flames had at least 20 on the year. And then there was the defense, or lack thereof. Colorado struggled to keep the puck out of the net, coughing up 322 goals, second only to the hapless Wichita Wind. Marc D'Amour made 42 appearances in net for the Flames, going 16-21-2 with a 3.87 GAA and one shutout. Tim Bernhardt had a much better record, a solid 19-11-1 mark with a 3.86 GAA in 34 games. Jeff Lastiwka and Jim Ralph also saw action between the Colorado pipes. Bernhardt got the nod for the majority of the postseason. The Flames broke two ugly streaks for Denver hockey fans: the city's first winning season in hockey since 1974-75 (the CHL's Denver Spurs) and it's first playoff appearance since 1977-78 (the NHL's Colorado Rockies). Colorado drew the third place Birmingham South Stars in Round One of the playoffs. The Stars finished just one point behind the Flames, with a nearly identical 41-37-2 record. Not surprisingly, the series was a close one. Outside of a 4-1 Flames win in Game One, the other games were decided by two goals or less. Colorado jumped out to a 2-0 series lead, only to see the Stars win four straight to advance to the Adams Cup Finals. Once there, they would be knocked off by Indianapolis in seven games (best-of-nine). 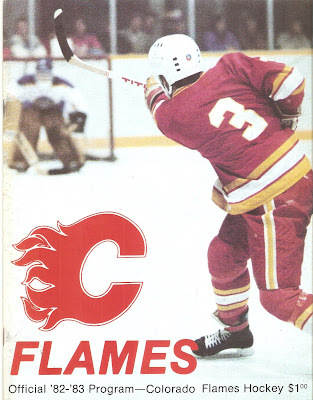 This was the first Colorado Flames program I saw on eBay, and I grabbed it for about $5. It's 46 pages long, almost all black-and-white, though there are a few color ads. The usual stuff is there: articles about the owner, the coach and the parent club are all included. Coach Page also has a "Coach's Corner" section where he discusses his philosophy on coaching and hockey. Each Flames player has their own bio in the last third of the program, and Page gave his thoughts on each. This program is from a game between the Flames and the Wichita Wind. No idea what date it was from, though. Local advertisements include Coors Beer, Super Foods, Schapell Jewelers, KIMN AM 95 and The Denver Post. Aftermath: The Colorado Flames would build on their initial success in 1983-84. Future Calgary Flames' stars such as goaltender Mike Vernon and defenseman Al MacInnis started their pro careers that year in Denver. The Flames ran away with first place in the CHL, with an impressive 48-25-3 mark, 22 points ahead of second-place Tulsa. In the playoffs, the Flames would be upset by the fourth place Indianapolis Checkers in six games. The Checkers, in turn, would be blown away by the homeless Oilers in four straight. While the Flames were successful, the CHL was falling apart. The league was down to five teams when Birmingham folded after '82-83. Tulsa's owners declared bankruptcy and abandoned the team to the league and the New York Rangers, who operated it as a travel team for the last several months. Soaring travel costs and declining overall attendance finally forced the CHL to fold after the 1983-84 season. Indianapolis and Salt Lake were both admitted to the IHL for the 1984-85 season. Despite rumors of also joining that league, Spedding decided to fold the Flames, likely due to heavy financial losses brought on by the USFL's Denver Gold. The IHL would eventually make it to Denver with the arrival of the Colorado Rangers in 1987, and the Denver Grizzlies in 1994. The NHL finally returned in 1995 when the Quebec Nordiques relocated to the Mile High City, then promptly won the Stanley Cup in their first year. The revived CHL also had a team in town, the short-lived Denver Cutthroats, who played from 2012-14 before folding.